Credit Score - How is it calculated? 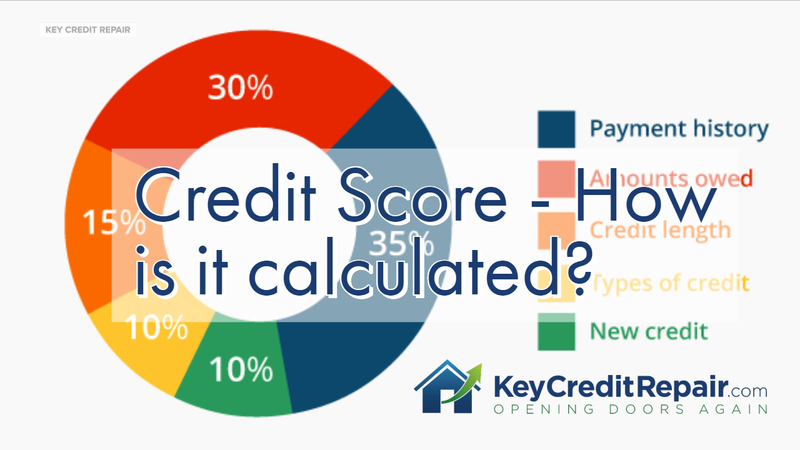 Home / Credit Repair Blog / Credit Score – How is it calculated? 00:01 Awesome credit question, guys, from Lori Magelky, Lori Magelky, nice to meet you, Lori. Um, and her, her question is real simple. How is a credit score calculated? So, guys, I’m actually going to pull this up and show you how it’s calculated. Okay. There are five parts. We call these the FICO 5 and if you simply just Google “FICO scores” and you click the images button, which is exactly what I’m doing right now, you’re going to see what makes up the credit score. Okay. So we have, let’s actually document this for you. We’re going to erase my pretty house. 00:39 So, the FICO 5 is going to consist of … we’ve got 30%, actually 35%, we have pay history, guys. Okay? 30% is debt. Then we have 15% length of history. Then we have 10% credit mix. And then another 10% for new credit. Now, let me elaborate a little bit on these numbers. Let me move to the side so you can see them. The first one is payment history. 35% of the score is just payment history. Anytime you get a 30 day late, guys, it’s going to effect your credit score in a negative way. Okay? That’s going to effect the 35% of your credit score. Okay? Uh, of what makes up your credit score. Any time you make a payment on time, okay? It’s due on the first, you made it on the first. It’s due on the first even if you made it on the fifth, it counts as an on time payment. You’re getting the great credit for it. Okay? So on time payments are number one. 01:41 The second thing is amounts owed. This is the big flop for a lot of, um, for a lot of our clients. Okay? Specifically the amount you owe in proportion to the credit limits on credit cards. Having past due balances and having items in collections. The amounts you owe is 30% of what makes up your score. So, for those of you that have never missed a payment on time, or excuse me, have never missed a payment, you’re paying everything perfectly for 50 years but you’re maxed out on your credit cards, you’re going to take a hit here. Okay? 02:10 The next 15% is the length of credit history. How old your accounts are. Older people tend to have higher credit scores. Why is that? Well, because their accounts tend to be older. Okay? Age does not go into the credit score but the age of your accounts certainly do. 02:27 Beyond that we have 10% which is new credit. When you get credit, people want to give you credit. Okay? Do you ever get approved for a credit card and then all of a sudden you get five new flyers in the mail for five new credit card offers that are even better than the one you just got? The reason for that is that inquiry is registered. That new account that hits your credit report is registered and you get a bump in your score. And all of a sudden you get more credit offers, guys. 02:52 And last but not least we have credit mix. This is a big one. Okay? Although it’s only 10%, it’s an easy opportunity. Some of you only have student loans. Some of you have only had a mortgage. Some of you only have credit cards. Those are the three types of accounts. Mortgage or real estate related, revolving, and installment. Okay? You want to have a mix of all of that. You don’t just want to have credit cards or mortgages or installment or two out of the tree. The ideal mix is one of each. Okay? The number of accounts isn’t as relevant as the mix of the different types of accounts. 03:26 So, guys, thank you again. Um, big thank you to Lori Magelky for that awesome question. And if you have any additional questions, obviously, hit us up directly at keycreditrepair.com. See you, guys.